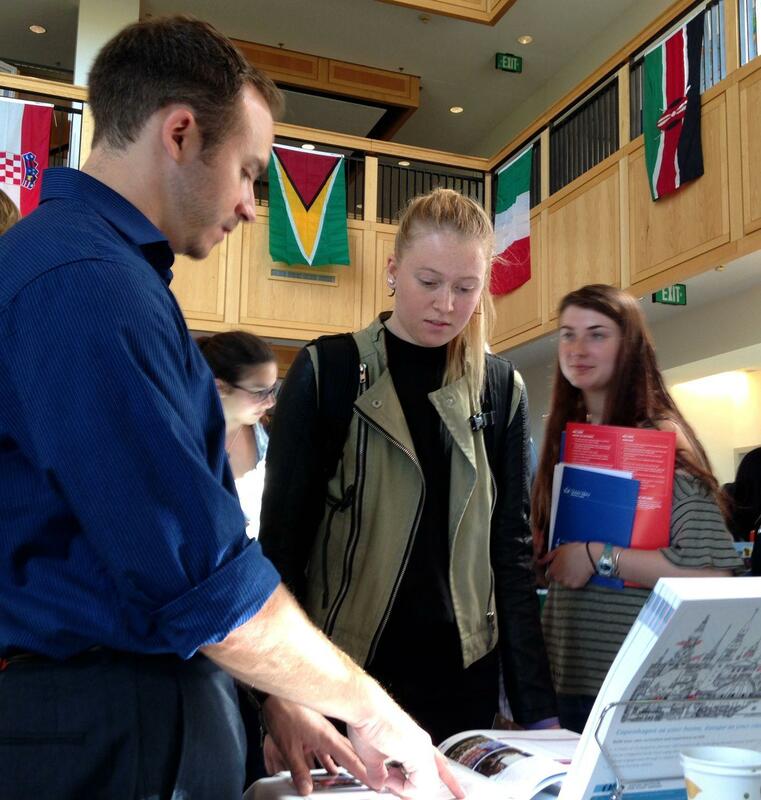 Students check out international study abroad options at Middlebury College. A record number of American college students are studying abroad - 282,000, according to the most recent data gathered by the Institute of International Education. Educators say that’s good, since international education promotes critical relationship building and cross cultural understanding. But many in the field worry the influx of technology and social media may be hampering the ability of American students to fully immerse themselves abroad. At Middlebury College’s annual study abroad fair, program administrators from all over the world recently touted their schools to travel hungry students. Barbara Hofer, a psychology professor at Middlebury College, believes it’s fairly new for people to be so connected while away. She’s currently researching the impact of technology on study abroad programs to provide more hard data on the subject. “It’s not just that they can email or text or make a phone call, they also have Skype; they have Face Time; they have Viber," she said, plus all the social media. Eric Law talks with student Grace Kennedy about the Danish institute for Study Abroad at Middlebury College's recent study abroad fair. Historically, she says students abroad had to find their own solutions to problems that might come up. But Hofer said today, according to her research, students are more likely to call their parents. That’s making important lessons of autonomy and responsibility harder to learn, she said, as well as impeding language and social skills. "When cell phones came along," explained Hofer, "the students could just call each other and say, 'Meet you at the bar at six,' and not have to go through that negotiation or show up at the kids’ house and pick them up which they once did and have to greet the person at the door." The Middlebury psychology professor said they were bypassing an entire arena of language immersion that they longer no needed because cell phones made that direct contact possible. Hofer said she’s still analyzing the data she’s collected on technology use, but says one of the most surprising early findings from her research is that face-to-face connections, like Skype, make many students more homesick, not less. Kaslow said technology is still important to her, but she recommends students who want to study abroad think long and hard about what their goals are before they go. Liz Ross, associate dean of international programs at Middlebury College, agrees. “There may be some people out there who say, no technology at all. But the reality is Spanish students are using technology to interact with each other, Argentinian students are using technology to interact with one another, so we’re not going to ban it, because it is the way people are interacting with this generation at this point in time.” But Ross said if the American student can learn to use the social media sites of their host country, in that country’s language as opposed to in English, she believes that would be more beneficial to the experience. And she said her staff is working harder to help students do that. Meanwhile, Barbara Hofer said she plans to publish the results of her research next spring. Computer scientists at Dartmouth College have developed an app for a student’s smartphone designed to monitor mental health. The so-called StudentLife app can track how much a student sleeps and whether he or she is having conversations and getting exercise. It also asks students about their state of mind and what they’ve been eating. The researcher, professor Andrew Campbell, says such data could be used to see depression or dangerous stress coming before it hits too hard. Beginning in January, the University of Vermont will offer a first-of-its kind professional certificate in food hub management. Food hubs are organizations that help connect farmers with restaurants and stores to sell their food, and they’ve been growing in popularity in recent years. Ann Karlen will be one of the faculty members of the new program. She’s the founding director of the group Fair Food in Philadelphia, and says food hubs are especially important to farmers who need a distributor for selling to larger markets. South Burlington teachers plan to strike starting next Tuesday, October 14 if they are unable to reach a contract agreement with the school board before then. The lead negotiator for the South Burlington Educators Association announced Tuesday that the roughly 200 teachers voted overwhelmingly in support of the strike.